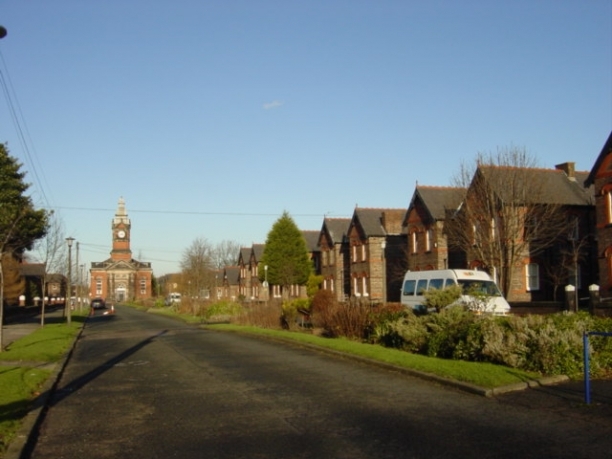 To the left of the photo can be seen the central hall, the site also had schools, swimming baths, an infirmary and workshops. These cottage homes in Liverpool were built in 1888 and opened on 27th March 1889 by the West Derby Union. They continued to function as children's homes until, according to archive records, 1964. 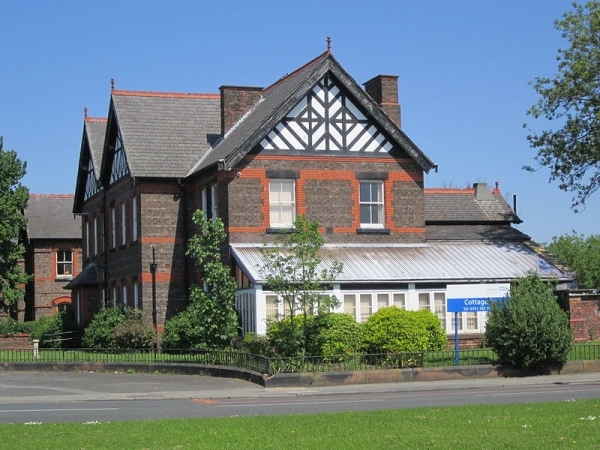 Fazakerley is an area near to University Hospital Aintree, to the north of Liverpool. There were 24 cottages in the complex each of which could house up to 25 children - a grand total of 600 children. At the top of the drive was a large clock tower. At some point, perhaps in the 1950s, the cottages were no longer known by their numbers but were given names after flowers or plants - perhaps suggested by what was growing in their gardens. "I was in the Fazakerley Cottage Homes in about 1961 or 1962. It was the first time my siblings and I had been away from our parents. My mother was ill in hospital and my father couldn't cope with us. I was 7 or 8 at the time and I was placed there with my brother and two sisters. We were looked after by two old ladies (I can't remember their names) who were very strict. I had a birthday shortly after being sent there, they did a bit of a special tea for me, but we were not allowed to talk at the table, we ate in silence. I remember my brother being sick because they made him eat tinned spaghetti which he hated, then they shouted at him for being sick! Then said "he couldn't have his cake either" as punishment. I remember being forced to wear shoes that were way too small for me as they didn't have any to fit me, and they wouldn't buy any, as the place was due to be closed. I subsequently ended up with deformed toes (hammer toes, I think they're called).The only positive memory I have of the Homes is that one of the ladies taught me to embroider. I used to sit at her feet while she taught me different stiches." Do you have memories you would like to share of being in Fazakerley Cottage Homes or the children's homes that followed them? We'd love to hear from you. 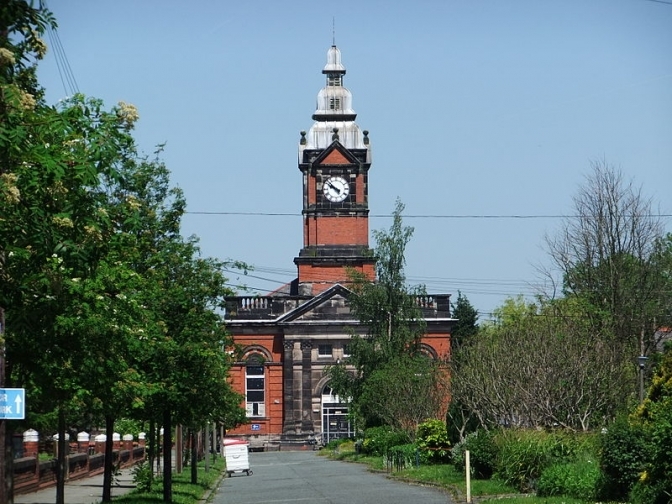 If you would like to help put together a book of memories about Fazakerley, please get in touch. We are looking for memories, photographs, plans / sketches of the buildings, co-editors... Please get in touch if you are interested. The Fazakerley Cottage Homes records consist of admission registers (352 SOC 1). There are no case papers available. The registers are closed (ie. cannot be viewed by the general public) after 1912 owing to the Data Protection Act but those wishing for information can obtain it through the Record Office either for themselves (subject access) or for some one else (third party presuming the subject is deceased) for a fee. After 1912 (i.e. 100 years) the search is done by Record Office staff and a transcript is provided of the information. Before 1912 the registers are “open” and anyone can look at them by appointment. The Record Office is currently in temporary premises owing to the reconstruction of the central library which should be re-opening in 2013 (see the website for details at www.liverpool.gov.uk and follow the links to libraries and archives). Form to complete if looking for information about someone else. Information leaflet about Poor Law Records held. For general information about accessing cottage homes records please see our page on this. several years, and it would appear that your members may not have known about them. We have attendances of 100 people, sometimes more, sometimes slightly less. We are aware that meeting people who were either in the Cottage Homes, related to people who were in the Cottage Homes, and any descendants of ex-Cottage Homes residents is very important to the people concerned. I would, therefore, like to advise you that we will be holding our annual reunion for 2015 on Saturday 27th June. 10am-6pm. Please email for details. All people who have an interest in Fazakerley Cottage Homes, Liverpool are welcome to attend. They do not have to be ex-residents or related in any way to residents or ex-residents. We provide, free of charge, teas and sandwiches, and there is no charge for attending. Simply turn up and mingle with ex-residents, their descendants, and other interested parties. Have a look at an article produced by The Care Leavers Association: to see what they have to say about our reunions." "Hello, my name is Lyn Wakefield and I work with young people in Fazakerley. Our recent play '80 Miles From Home' was performed at the Unity Theatre, Liverpool and starred young people from the area alongside professionals. It was about Liverpool evacuees and received good reviews. I'm really interested in developing a play about Fazakerley Cottage Homes and basing it on the experiences of those who lived there (we can change names, dates etc as appropriate). I'd love to hear from anyone who was living at the cottages homes and may be interested in sharing their stories? Please email me at Afaliverpool@aol.com. Thank you."